The FACSS Student and Tomas B. Hirschfeld Scholar student awards are presented to outstanding graduate students who wish to attend SciX and present their work at the SciX conference. These awards require submission of an application at the SciX conference website. The FACSS Student award was formalized as a permanent standing award at the FACSS meeting in the fall of 1987. The award had existed prior to this meeting but until 1987 was funded based on yearly approval from the Governing Board. The Hirschfeld Scholar Student award was found in 1987 based on a written proposal submitted by Professor Alex Scheerline. The minutes of the March 1987 meeting record that "FACSS shall support an annual award program, as the result of which, up to four graduate students will be designated as Hirschfeld Scholars, with preference for diverse research specialties among the students." Edward D. Hoegg is a graduate student at Clemson University where he works for Dr. R. Kenneth Marcus. Ed is originally from Allentown, Pennsylvania and earned his B.S. in Chemistry from Washington College, in Chestertown, MD. Following the completion of his undergraduate education, he was awarded a Science and Technology Policy Fellowship at the U.S. Department of Energy (DOE) where he worked on the SunShot Initiative, a national initiative to reduce the cost of solar energy. During his three year tenure working on the SunShot Initiative, his research focused on thermal energy storage for concentrating solar power. 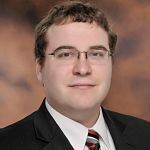 While at Clemson, he has been given the opportunity to conduct research at Pacific Northwest National Laboratory (PNNL) where he remains a PhD Intern in the DOE International Nuclear Safeguard’s Human Capital Development Program. With the goal of developing a field deployable mass spectrometer capable of meeting the International Atomic Energy Agency’s (IAEA) International Target Values (ITVs) for Measurement Uncertainties in Safeguarding Nuclear Materials, Ed’s research has been focused on interfacing the liquid sampling-atmospheric pressure glow discharge (LS-APGD) with Orbitrap mass spectrometers for high accuracy, high precision isotope ratio measurements. Although this work has relied on using two large unknowns in the field of isotope ratio mass spectrometry, it has offered a number of surprising results. To date, for each of the depleted, natural and enriched uranium samples measured, the corresponding ITV for that sample type has been exceeded. As part of his research, and to continue his education in nuclear safeguards, Ed has worked at Los Alamos National Laboratory as a visiting scientist and was selected as a participant in the 2017 Japan Nuclear Facilities Experience. In addition to using the LS-APGD for isotope ratio measurements, Ed has used the ion source for detecting metals in cell media samples, in a preliminary study that was completed in a partnership with Merck & Co. For his work Ed has received a number of awards that recognize his work both in and out of the lab, including Washington College’s James R. Miller Award for Excellence in Chemistry, a Certificate of Merit presented by the Defense Threat Reduction Agency, and the Chemistry Outreach Award and Graduate Faculty Award presented by the Chemistry Department at Clemson University. Katie Spalding is currently a final year Ph.D. student, working within the Spectral Analytics Laboratory led by Dr M J Baker in the Technology and Innovation Centre, Department of Pure and Applied Chemistry, University of Strathclyde. Her research on “Developing Spectroscopic Biofluid Diagnosis, Monitoring and Therapeutic Profiling of Melanoma Patients” aims to combat problems with the late diagnoses of melanoma through the development of a blood based spectral profile for the disease. Katie is originally from Glasgow and in 2015, she was awarded a 1st Class MChem (Hons) in Forensic & Analytical Chemistry from the University of Strathclyde, where she received the SCI Scotland Prize in Analytical Chemistry for the best undergraduate in Analytical Chemistry. Within her first year of postgraduate study she was invited to give younger member presentation in Minneapolis at a special session on biofluid spectroscopy held at SciX. Katie has published in a clinical journal (Brain & Behav., 6, 1-8, 2016), has contributed to two submitted patent applications (WO 2017221027 & PE958329WO) and presented 5 oral/poster presentations at national and international conferences. Katie obtained funding from the ScotCHEM Early Career Researcher scheme to carry out research abroad at François Rabelais University. Katie was also selected to take part in the Frontrunner leadership programme, leadership development for 3rd level students who have a track record of leading change. In addition, she is committed to helping younger students and widening participation in further education. As such she is a STEM ambassador, student mentor, demonstrator and has been chosen to take part in the Accelerate programme as a mentor for the last 2 years running. Accelerate is a one-week programme for widening access to higher education for pupils thinking of going to university. Katie has dedicated her final year of postgraduate study to carrying out a large-scale patient study. Through the analysis of melanoma patient serum samples, she hopes to use ATR-FTIR spectroscopy to monitor patient disease progression and response to therapy. Katie’s keen interest in the translation of spectroscopy to the clinic is apparent from her time spent at Royal Preston Hospital in addition to full-time study at the Department of Pure and Applied Chemistry at the University of Strathclyde. Katie’s presence during the melanoma clinics provided Katie with the opportunity to interact with patients and has given her a strong drive to make a difference, working with clinicians to improve patient mortality and morbidity. In order to have their presentation considered for a Tomas Hirschfeld Scholar Award or FACSS Student Award, students must complete this FACSS-Hirschfeld Student Awards Application Form AND submit their abstract for the SciX conference. Submitted abstract must include box checked for FACSS - Hirschfeld Student Awards (checkbox is within the online abstract submission process).